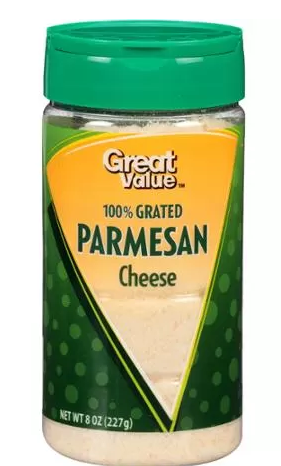 A customer filed a lawsuit [PDF] against Walmart, accusing the retailer of defrauding customers by stocking its New York stores’ shelves with containers labeled “100% Grated Parmesan Cheese” when, tests show, it contained up to 10% cellulose. Cellulose is often used in grated cheese products to keep it from clumping. As much as 4% cellulose is deemed acceptable to meet the Food and Drug Administration regulations for what can bear the label Parmesan. However, a years-long investigation by the FDA found that some companies were shilling grated Parmesan product that contained a lot of cellulose and minimal Parmesan cheese. The man claims that he suffered injury and lost money as a result of Walmart’s allegedly deceptive, misleading, false, unfair, and fraudulent practices. The lawsuit seeks class action status for the fraud claims. While the suit appears to be the first filed against a retailer, Bloomberg reports that a California customer sued Kraft last week over similar claims, alleging that the company’s misrepresentations led shoppers to pay a premium for its products. Issues related to the composition of grated Parmesan cheese came to light recently when Bloomberg News tested several brands. Those tests found high levels of cellulose in some products, including Jewel-Osco’s Essential Everyday 100% Parmesan Cheese. For example, Jewel-Osco’s offering had a level of 8.8% cellulose. The grocery chain recalled the product from all of its 185 stores last week, and plans to phase out the brand and replace it with its Jewel-Osco Signature Brand.